Climate services have been promoted as essential for promoting resilient agriculture. Delivered timely, and in a way that users can understand and apply, climate services can help farmers make better decisions around crop management, for example on what crops to plant and when to sow. In Rwanda not all farmers have access to climate information, and those that do have access do not always use it. This Info Note* describes the key results from a survey undertaken as part of the CGIAR Research Program on Climate Change, Agriculture and Food Security (CCAFS), which aimed to to establish a baseline about the use of climate information by farmers in Rwanda and share insights into the current status of and needs for climate services in Rwanda. *Key results from the survey are shared below. Download the full Info Note from the right-hand column for more detail. Farmers’ awareness of climate change varies by province. Few farmers routinely access and use climate information. Limited awareness and relevance of available climate information limit its use. Several communication channels are important for ensuring farmers have equitable access to useful climate information. Few farmers actively seek climate information. Awareness and access to climate information are gender-dependent. Farmers face several challenges to using climate information effectively. Training offers opportunity to overcome the challenges that farmers face. Low use of climate information may be linked to low farmer resilience. A random sample of 3,046 respondents was nationally surveyed in the all four provinces of the country and in the city of Kigali. A total of 52% of the sample were female respondents, while two-thirds of the households interviewed were male-headed households. The baseline includes outcome indicators related to access, use of climate information, channels of communication, behavioral change and perceived livelihood benefit/impact. *Note that these insights represent the status and needs for climate services in Rwanda as of September 2016. Please refer to the full text for more detail. Farmers’ awareness of climate change varies by province. Although most farmers have heard about climate change in some regions, awareness levels remain low in others: in Southern and Western provinces, as many as 60% of farmers interviewed were not aware of climate change. This highlights the need to raise more awareness on climate change in order to support farmers’ adaptation to climate change. Few farmers routinely access and use climate information. In all districts surveyed, farmers have little access to specific types of climate information products. The most common types of climate information products accessed include forecasts of onset of rains, seasonal forecasts, daily weather forecasts and forecasts of extreme events. Indigenous climate forecasts represent the only climate information that is consistently available to farmers, and therefore seems to influence farmers’ decisions more than other forms of climate information. Limited awareness and relevance of available climate information limit its use. The information that is currently disseminated is provided at a district scale, which limits its relevance to farmers’ local decisions. There is great scope for improving the relevance of climate information by, for example, downscaling the information, and including the distribution of rains and risk of dry spells. Several communication channels are important for ensuring farmers have equitable access to useful climate information. Radio is the main communication channel for climate information in all provinces. Information dissemination through cell phones is almost non-existent, although a cell phone is the most common communication asset owned by farmers, followed by radio. There is a mismatch between ownership and usage of communication assets and a great opportunity to reach a large audience of farmers through interactive radio programs and cell phone-based climate information. The second most used channel of communication is government extension agents – this channel also provides an opportunity for reaching farmers with climate and weather information. Few farmers actively seek climate information. Very few farmers—less than one-third—actively seek climate information. Men seek more climate information compared to women—regardless of the types of information products. This may be due to men having a better understanding of its use for farming activities and their role as the main decision makers, with regards to the inputs and agricultural investments for farming activities. Awareness and access to climate information are gender-dependent. Men have significantly greater access to climate information compared to women, and their awareness and knowledge of climate information is also greater. 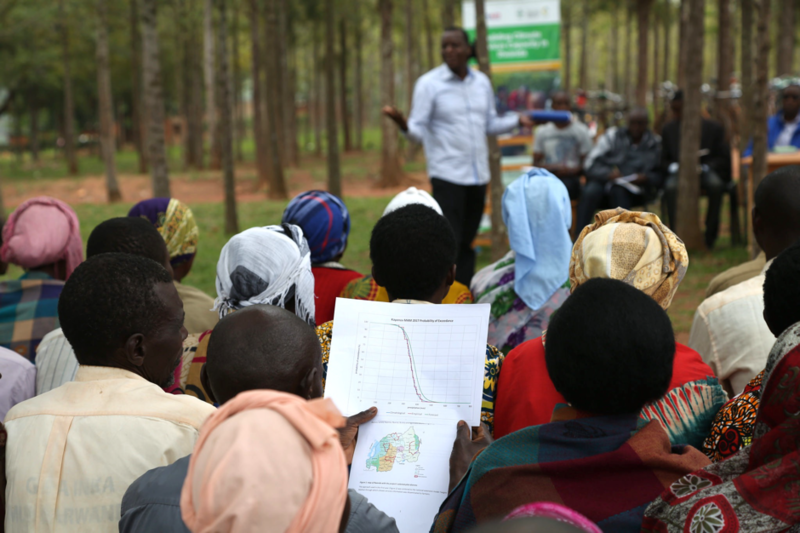 Increasing uptake of climate information will therefore need to build more awareness among women, and provide knowledge on how they can tap into this information to improve their planning and farm management decisions. Farmers face several challenges to using climate information effectively. Ability to use climate information is variable across Rwanda. Apart from poverty status—which is correlated with ability to use climate information, lack of trust in the information provided and lack of locally relevant climate information were cited as the main constraints preventing extensive use of these information products. The small percentage of farmers who actively seek climate information indicates that the use of climate information has little influence on farmer decision-making. Tailoring of information to meet the needs of the agricultural community is key. Training offers opportunity to overcome the challenges that farmers face. Almost no farmer surveyed had ever attended training on climate information. The results suggest that training, such as the Participatory Integrated Climate Services in Agriculture (PICSA) approach, holds promise for raising awareness and increasing farmers’ capacity to act on climate information. Educational radio programs offer important support to disseminate climate information. They create a space for interaction where end-users, intermediary extension agents, researchers, climate information producers can exchange information, share concepts and thereby build end-users’ knowledge and capacity to use climate information. These educational radio programs have been mostly useful to inform crop decisions. The majority of farmers interviewed reported that they changed some of their crop decisions after listening to these programs. Low use of climate information may be linked to low farmer resilience. Generally, the benchmark level for resilience is also low. The observed lack of influence of available climate information on farm management decisions appears to contribute to low values for resilience indicators. Results also suggest that using climate forecast during a single season has not improved ability to use climate information, therefore services that facilitate uptake and understanding over time may be needed to effect behavior change. This report is an output of USAID’s Rwanda Climate Services for Agriculture project, and was made possible through support provided by the Rwanda Mission, USAID.